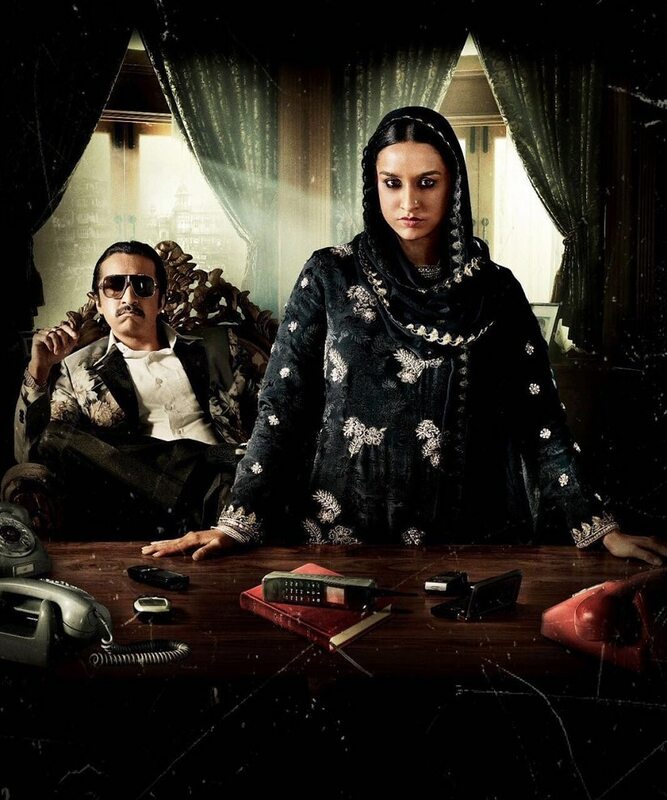 Today, we're live reviewing Haseena Parkar, starring Shraddha Kapoor as Dawood Ibrahim's sister. Dawood, in this Apoorva Lakhia directorial, is played by Shraddha's real-life sibling, Siddhanth Kapoor. The opening scene features a Mumbai sessions court where Haseena (Shraddha) is all set to make an appearance at a hearing. "Main hoon Haseena Parkar," she says — and just like that, we're off. In court, Haseena is being questioned about her involvement in her brother Dawood's business. She's also accused of using his name to extort others. Haseena then begins to narrate her story, and we travel back in time to Mumbai in the last '70s. Dawood (Siddhant) and Haseena's father is in the police force and the family isn't financially well off. Dawood doesn't get along with their father; he's brash and rebellious. Along with their brother Saabir, Dawood sets up an illegal business and the duo begin their transformation into dons. Haseena, meanwhile, is growing up. We see how her relationship with Dawood develops; she also marries a small-time actor called Ibrahim (Ankur Bhatia) and they have a baby. A note about the performances thus far — Siddhanth Kapoor does a decent enough job portraying Dawood but Shraddha's act seems forced. She shakes, blinks, behaves immaturely — perhaps the intention was to give some idea of Haseena's real life tics, but that doesn't translate very well in this performance. The wedding night scene for instance, is supposed to feature Haseena sitting anxiously in bed: Shraddha shakes uncontrollably to depict the character's inner turmoil, but somehow the effect overall seems practised and unreal. It doesn't help that the characterisation is all over the place. On the one hand, Haseena is presented as this fiery, zero-f**ks-to-give woman; on the other hand she can be naive to the point of appearing dumb. So she'll stand up to the neighbourhood bully over drawing water from the communal tap (and be hailed by everyone else as a heroine), and also slaps a man twice. On the other hand, on seeing her husband being beaten up by a fellow actor for a scene in a film which they're shooting, she actually asks Dawood: "You think anyone can beat Ibrahim? Because this one man was beating him up the other day and he didn't say a word!" It's a weird, jarring moment from a woman who is presented as being very aware and capable of more than holding her own. We see all of this as part of Haseena's courtroom narrative. Then we're back again to a flashback sequence — this time, of Saabir's death. Saabir is shot dead by a rival Pathan gang — but not before he delivers a filmi stare-down to the leader of his assassins, as a final bullet is pumped into his forehead. Haseena sees his body and bursts into loud tears. Nuanced acting is clearly not Shraddha's forte. Meanwhile, Dawood kills two main members of the Pathan gang as an act of revenge. The police tightens their grip on the underworld after which, Dawood leaves the country. He meets Haseena for the last time in an emotional farewell (unfortunately, we're a little too distracted by how fake Shraddha's skin tint looks here to be overly affected). Cut to the present, where the courtroom interrogation continues. We now see how Haseena's husband was killed: Depite being riddled with bullets, Ibrahim manages to move up and down the stairs, and in a scene that looks as though it was shot by Rohit Shetty, the camera focuses on his shoes as he takes careful steps, dodging bullets. Haseena takes Ibrahim to the hospital in a taxi: this is where you would usually expect the best from an actor but Shraddha seems inert in this scene. Overall, you get the impression that Shraddha was confused about how much emotion to put into these scenes: she shakes in situations that require her to look moved, she's inert in a situation that calls for her to look more stirred. Just to make things clear — Haseena Parkar is not a bad film. It's just that this isn't an exceptional film either. When Mumbai is crippled by the bomb blasts, Haseena is summoned to the police station repeatedly because Dawood allegedly has a hand in the blasts. This second half brings forward a much more believable performance from Shraddha. She now depicts Haseena as someone who is more refined, mature and not caricaturised. She basically 'arrives' in the second half. Keeping her courtroom appearances aside, where she's appearing after years of contact with the underworld, her police station visits serve as a great showcase for Shraddha's portrayal of Haseena. The bombing sequence is especially well shot — everything freezes, men, objects, vegetables fly through the air, flames break out — it's a standout scene. In her brother's absence, Haseena takes over the reins of the business in Mumbai. She's now known as 'aapa', and her catch-line is: "Is ghar ki deewaro ko bas meri oonchi awaz ki aadat hai". At the start of the film, we saw Haseena's father asking her to cover her head and stay 'within her limits' when she tries to protect Dawood from him. Now she is the matriarch of her house. She beats her son Danish up in the same way her father used to beat Dawood during their childhood. Danish becomes a small-time goon and all Haseena's fears come true when he too is killed in an accident orchestrated by his rivals. Shraddha tries to cut a bold figure, but it's hard to take her seriously amid all the costume-ry and hamm-ishness that surrounds her in this film, in the form of the minor characters. The police station interrogations remain her best act. We won't reveal more about the court battle and how Haseena's legal troubles end. The film concludes with a cliffhanger of sorts, and we're left with several questions we do not know the answer to. What we do know, is that the makers wanted to name the film 'Haseena: The Queen of Mumbai'. Good they didn't, because that would've been a tall claim given how inconsistent the film and its lead actress are. Watch the trailer of Haseena Parkar here.